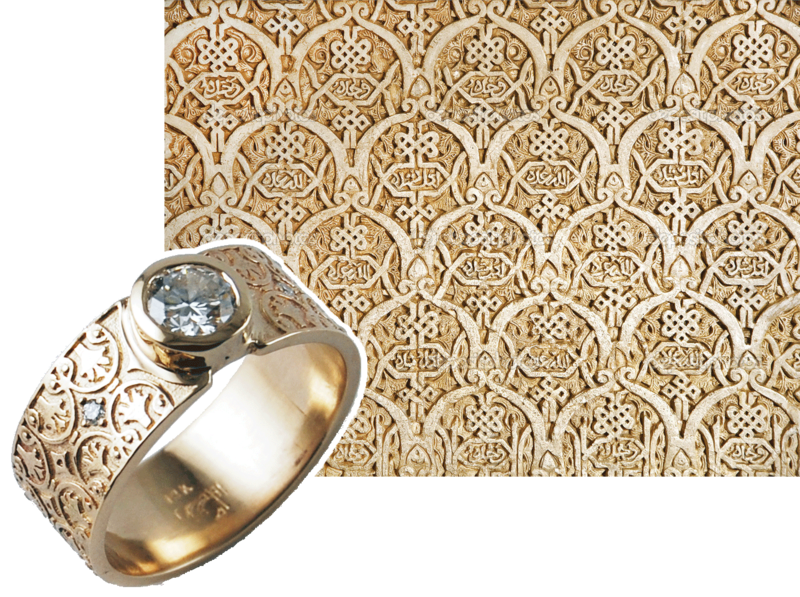 Equinox Jewelers showcases the design work of John Schick, Dian Lockman and Shaleigh Westphall. The three of us take joy in living here in Portland, surrounded by so much natural beauty, and strive to express something of the essence of this place in our jewelry. Cadiz Band, with a wall carving from the Alhambra. A sword hilt fitting from the Staffordshire Hoard, 7th century gold artifacts found buried in a farmer’s field near Birmingham, England. John’s Staffordshire Band takes its motif from the mythical beast engraved on this ancient armor . Architecture, history, art, and the natural world are strong influences in our work. 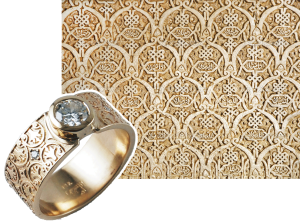 We find inspiration in the richly ornamented surfaces of the Alhambra, the structure of a crystal, the tessellations of M.C Escher, and the ethereal patterns of Gustav Klimt. In the Painted Hills Band; the rippled, receding details mimic the striated appearance of the Painted Hills near John Day, Oregon. John Schick has been the primary designer at Equinox since its inception in 1976. Four decades of experience shape his work. He delights in the natural world, as well as in design throughout the ages. 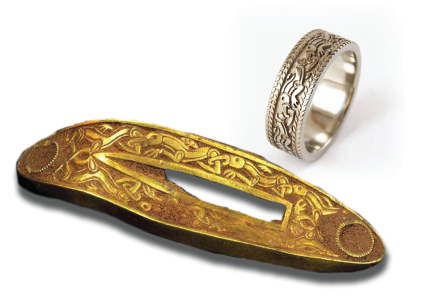 His love of pattern, texture and organic forms energizes the jewelry he creates. 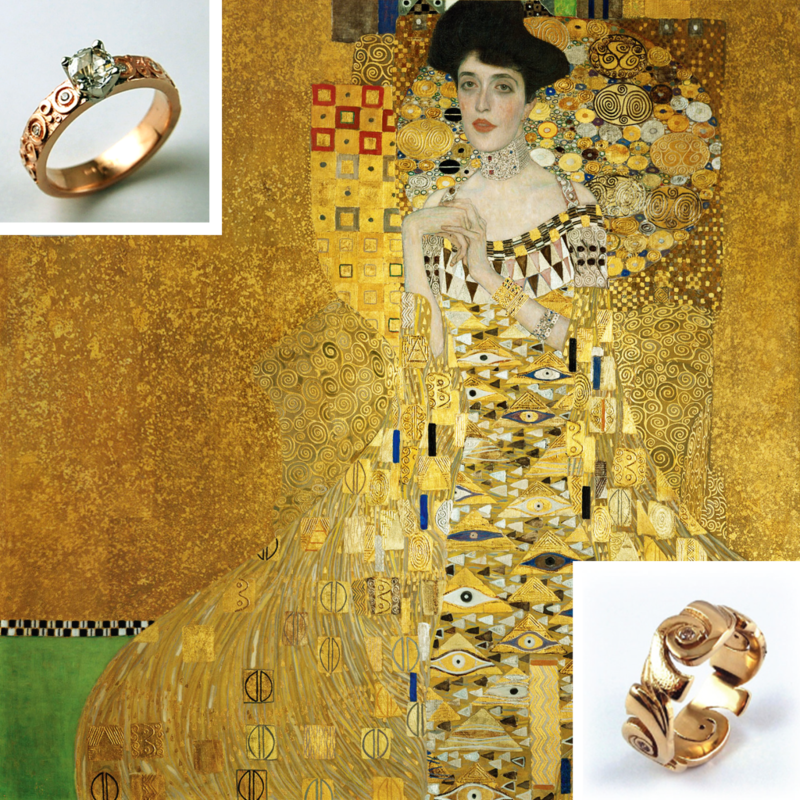 Granada solitaire, Galaxy band and Gustav Klimt’s “Portrait of Adele Bloch-Bauer I”.